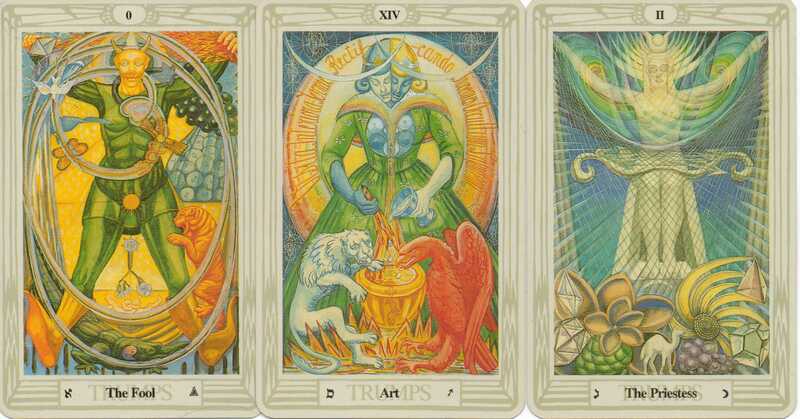 Over the last day or two, I’ve experimented with a couple more spreads using the Thoth and I’m finding that the astrology/Hebrew letters etc does not seem to work so well when I have a vague intent. For example, ‘tell me about my day today’ does not yield anything useful. Yesterday I ended up with something relating to my sister’s cat and my nephew which I could make no sense of! A very specific question on something that matters, rather than being simple curiosity, seems to be much more effective. The question I’m using today is one that I’ve taken from Rachel Pollack’s book ‘Tarot Wisdom’. The cards themselves give a simple narrative. 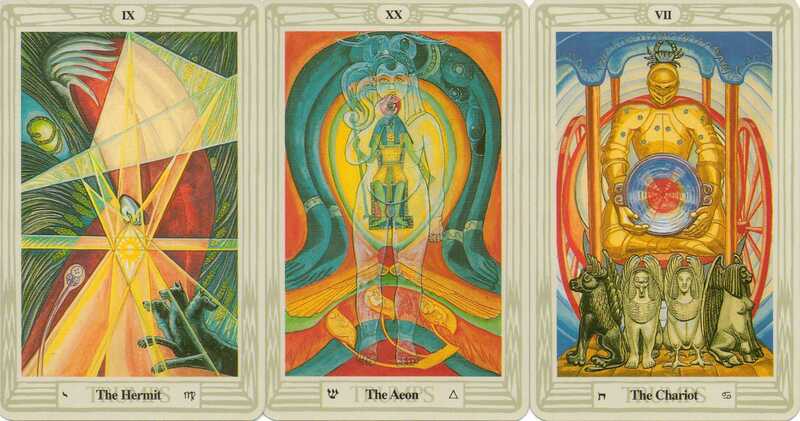 The Hermit searches for truth and the light of knowledge, Aeon brings a rebirth/an awakening and the Chariot brings the will to drive forward. On one level I am strengthened by my desire for knowledge and how I use that to reinvent myself and progress forward. The letters of the Hermit and Aeon combine to give ‘shy’ which is quite appropriate. I’ve always been quiet and shy, reluctant to share what I have learnt with others. My light does not always shine out for others to follow but, like the Hermit, I use it to guide myself. Lon Milo Duquette described the hand as being the creative part of a human being in his book ‘Chicken Qabalah.’ It is an idea which resonates with me. As humans, we do use our hands to bring into physical creation the ideas which are in our heads. The tooth is something used to chew gently or to tear into and the fence represents something we put up when we have something to protect. There is an underlying need in me to be creative, to be able to have time to ‘masticate and chew the cud’. This time is something I like to ring-fence. Virgo – Fire – Cancer is a interesting trio. My immediate thought on seeing these attributes was my mother. She was a Virgo who died of cancer but her spirit (Fire) is still inspirational. She always embodied female strength to me and I can take comfort in the fact that I share at least some of her qualities. I’ve had a bit of a blogging break due in part to starting a new job and also to wanting to spend more time studying aspects of tarot. Specifically, I wanted to spend more time with the Thoth. I’ve had this deck for many years and love reading with it. However, there is so much depth to this deck that sometimes I feel like I’m just scratching the surface. What do I need to focus on next at work? Interesting! How to make sense of it? The letters can be rearranged to spell the words ‘Sag’ and ‘Gas’. Ox and camel are both used to carry things or be of service. A camel travels and an ox used to be a sign of wealth. The prop suggests something used to keep something in place. Sagittarius is linked to the time period of 21st November to 21st December. Air and Moon suggests emotional speech to me. The Fool suggests an element of naivety and the Priestess guards a threshold. Putting this together I can see that the focus is on the time frame of November/December. There may be some emotional talk at the office and general ‘gassing’. Too much of this talk could lead to some people’s morale ‘sagging’ and needing to be propped up. A key part of the business is field sales which could be the ox (wealth) and camel (travel) so this talk could relate to that. There is advice here to keep my eyes open, not be too naive and make sure I stick to the right mix in order to progress through my probationary period (threshold).